• Marat Safin actually rallied to win a match for the first time in what seems forever over in the L.A. tournament! It's so crazy to think that if he wanted to, he could easily be a top 10 player instead of retiring. • I know he's just a kid and has plenty of years ahead of him, but I'm just not that high on Ernests Gulbis. • Speaking of L.A., Tommy Haas, ranked 20th, is the top seed there. Remember when L.A. used to have top 10 players galore competing there? And speaking of Haas, I wonder if he'll go down as the best player, male or female, to never make a Slam final? I have him locked in that spot so far. • In my previous post, I talked about Dinara Safina playing Slovenia. She ended up winning, but wouldn't it be great if she were in California this week facing real competition? • And while I'm taking a quick glance at last week, how about Robby Ginepri winning in Indy over Sam Querrey? By my calculations, Ginepri has now joined the ranks of active U.S. men with three titles or more, bringing that list up to five. That's a far cry from the Agassi, Sampras, etc., days! • I'm glad Maria Sharapova is out there winning some matches. I'm not sure about the rest of this year for her, but I really think 2010 will be good for her. • Nikolay Davydenko always surprises me. He can go the whole summer season without playing a hard-court event then make the semis at the U.S. Open. I wonder if winning Hamburg last week will set him on a roll. I guess we'll see after Umag! • Where's Andy Murray, Novak Djokovic and Juan Martin del Potro? I know Djoko made a cameo doubles appearance in Umag, but why isn't he and those other guys playing? Wimbledon was a long time ago. • Glad to see the Williams sisters out in Cali. But why are they playing doubles? That's more time than they're usually on the court. Hope they hold steady. 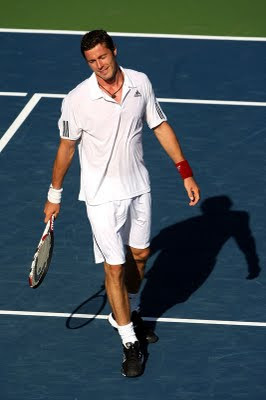 • I don't know why I'm still thinking about Marat Safin, but did you know he's only won one tournament in the U.S.? • The tall boys, John Isner and Sam Querrey, have been playing pretty well this summer season. • The ATP's new Web site kind of confuses me! • Nic Kiefer is over in Europe playing one of the clay-court events. I wonder why is he there instead of L.A. on a surface he's competed best on in his career. • Speaking of guys named "Nic," I see Massu has made it to the quarters of Umag. Why did he fall off a cliff rankings-wise, I wonder? Anyway, I could go on, but I think I'll stop there. Just wanted to share some random thoughts! Why is world number one Dinara Safina playing this week's tournament in Slovenia? And is it a good or bad thing? I saw that she won through to the semis today, which is good. That prompted me to look at the draw, and after examining it, the event looked like it should be played on the ITF circuit! Top 10 players nowadays don't go to events like this. And I almost feel bad about bringing up this old nugget because I'm sure Safina hears it enough: number-one players WITHOUT a Slam under their belt definitely don't play these type of tournaments! The summer hard-court season really gets under way in California in a matter of days. Shouldn't she have waited until then? That way, she'd be fresher to face the stiffer competition that will be out there the next few weeks. Also, say she wins this tournament. Granted, it's not the toughest of opponents Safina will face, but it's still going up against women that will be fighting tooth and nail for this small title, so the intensity will be higher than in a practice match. There's no need to deal with that now. No one else in the top 10 is bothering with that, so why is the number one? If Safina happens to lose, by some miracle, then what does that do the confidence? And heaven forbid, if a hamstring is tweaked here. But on the other hand, it can be perceived as a good thing that she's playing. Maybe Safina wants to go all out this week and practice was getting dull. It's also great for the fans that attend the tournament, to have the opportunity to see one of the world's best take center stage. I know I'm probably being naive, but I hope it's not just an appearance fee situation. Because there's plenty of money to be made at the big events, which could also be a better warm-up for winning that first big one. The situation for some of the ATP tournaments in Germany have definitely taken a turn for the worse the past few years. Take, for instance, last week's stop in Stuttgart, which was won by Jeremy Chardy. Three top 20 players showed up, which isn't bad for an ATP 250 tournament. But did you know this used to be the fifth-biggest clay-court event on tour, after the French and the three Masters stops? Rafael Nadal, Thomas Muster and Gustavo Kuerten, three of the greatest clay-courters ever, all have titles there, as do Andre Agassi and Alex Corretja. Now it looks like the tournament will no longer be able to attract players of that caliber, to say the least. And how about this week's event in Hamburg? What was once the fourth-largest clay stop and one of the game's oldest tournaments lost its elite status. You're two-most recent champions there happen to be only a couple of guys named Nadal and Roger Federer. Top seed there this week? Gilles Simon, who promptly lost today. It's actually such a bad thing going on at this tournament that at least from the stories I've read, event director and 1991 Wimbledon champ Michael Stich is playing doubles to help ticket sales. Talk about an event falling on hard times! I don't know if it's just the overall state of the economy around the world or the German tennis foundation not getting behind the tournaments enough promotion-wise or what. All I do know is that it's an extremely sad sight to see events with such a rich history be reduced nearly to insignificance. This is kind of surprising to me, but it seems like the most interesting things in tennis happening this week are going down in World Team Tennis! Earlier this week was the shock heard 'round the world when teenager Madison Keys beat Serena Williams in a singles match. When Serena loses to anyone, it's usually considered an upset. But to a kid? Wow. Then just tonight, the Washington Kastles and MY Sporttimes got into it pretty hot and heavy, which resulted in Sporttimes coach Chuck Adams getting suspended after charging his players were hit by balls. And from the story I read, John McEnroe had to get in there and play peacemaker. What is the world coming to? Maybe something like that will happen while I'm watching! You know, going back to last Sunday, it's been kind of a rough stretch for the big U.S. guys out there. 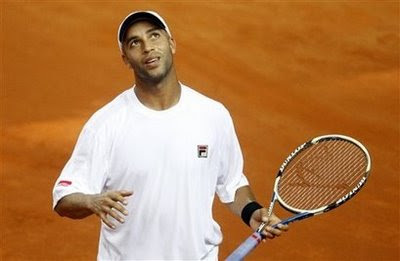 I mean, thank God, for Rajeev Ram and his win in Newport, right? From Andy Roddick's tough loss to the Davis Cup devastation of Mardy Fish and James Blake, the five-setters have not been those guys' friends. I was out of town most of last week with limited Internet access, but was following the Davis Cup news on my cell phone. I couldn't believe what I read Friday evening that Blake and Fish both lost in five to Ivo Karlovic and Marin Cilic, respectively. The scorelines show the matches were exciting, I guess, with Blake getting rallied on and Fish coming close against young gun Cilic. But (and excuse my venting going forward) geez! How come if Roddick's not playing and you throw out two top-15-talent-level players, the squad immediately becomes an underdog? Why aren't Blake and Fish capable of coming through in clutch performances? I'm always rough on those guys, I know, (and you do, too, if you read this blog) but I just wish they would step it up when the heat is on. I consider myself fans of theirs, but it's pretty tough being one at times. I would say my belief that Blake would have a chance against Cilic in that fourth rubber was at 5 percent or less, which shouldn't be the case if you were to go by ability. You all also know I'm a big Davis Cup fan and I just wish my home team was in a little better shape. Or was capable of pulling it together like Israel (ISRAEL!) did against Russia. Look at what Dudi Sela, Harel Levy, Jonathan Erlich and Andy Ram did: Wow! It's all about how much you want it, I guess, and I wish that could've been on display in Croatia. That was some tournament, huh? (in what can be classified as the understatement of the year!) Epic matches, history being made, amazing performances, just inspiring. To some, is a mystery! with such heart and passion! On returning to Wimbledon glory. But will you get the top spot again? I guess that's a different story! I mean, come on WTA! For winning Slam after Slam after Slam? For making quite the run. That you're far from done. Even though you fell short at the end. At least it was to your sis and best friend! Congrats to the old guys. You know, Haas, Ferrero and Hewitt. Showed they can still do it. For putting up quite the fight. For handling the pressure well. A Major's in your future, for sure. That's not so hard to tell! For pulling off a great feat. Than pulling off a repeat! There were many other great examples. So I'm sorry if In this poem I missed one. I don't think I've been happier to be wrong as far as making predictions go! 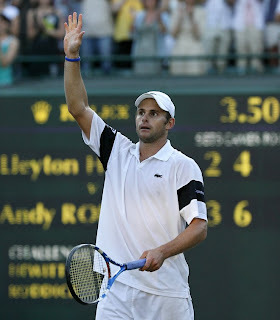 That was an awesome win by Andy Roddick today against almost everyone's tourney finalist fave (including TTA? 's) Andy Murray. I was hoping Roddick would be able to pull it off, but I just thought Murray had his number and wouldn't have had any trouble with those bombs Roddick's been bringing to his matches. Roddick played a very solid match, probably the best all-around one I've seen since that U.S. Open title run in '03. And I was particularly impressed with his demeanor in this match and the other day against Lleyton Hewitt. There was none of that over-the-top getting fired up that's been on display the past couple of years, which didn't even seem authentic to me: It just looked like it was an unnecessary energy drainer. But as much as Roddick has shown this tournament, a lot of credit has to go to his team. Getting Larry Stefanki as his coach was a great move that has really paid off this year, and I guess the marriage thing is working for him, too! Anyway, it's a great win for him and I bet Breakfast at Wimbledon will be a good one! For some reason, I have some serious doubt about an all-Williams final happening! It's not like they're playing bad or anything—far from it, in fact. But Elena Dementieva's also been playing incredibly well and looks to have shaken whatever funk she was in. And while Dinara Safina hasn't exactly looked like the second coming of Venus, she's been fighting through, which is always good. I wouldn't mind seeing an all-Williams final, and it is the call I made at the beginning of the tournament. But I just can't seem to shake those nagging thoughts. I guess we'll see what happens by the end of the day! UPDATE: So much for those doubts! But seriously, I, like millions of others, have been totally engrossed in the Big W, and today offered up some great results. How about that Tommy Haas? He's actually had a dominant grass-court season this year after having never really done too much on it in his career. I thought Marin Cilic was going to come through in that quarter, but Haas got him early on in one of the matches of the tournament. It doesn't get any easier for Tommy Boy, seeing as he only has to play THE man, Roger Federer next in the semis. Fed got through Ivo Karlovic, who had been blasting dudes off the court, easily enough. He and Haas should have a decent match next. But the match I've been waiting for all tournament should overshadow theirs when Andys Murray and Roddick go at it. They've both gone through some battles to get to this point: Murray in that classic against Stan Wawrinka in the fourth round and Roddick's five-setter against Lleyton Hewitt today. Anyway, I'm pulling for Andy to win! Seriously, though, whichever one did come through would make for a great story and I'm just hoping for an entertaining match (but if Roddick were to win, I wouldn't think it was the worst thing in the world)! Like what you read on Tennis Talk, Anyone? Then become a fan on Facebook®! I'm sure you're already on there, so why not add TTA? to your page? Just click on the badge!